In medium bowl, mix dipping sauce ingredients. Cover; refrigerate while continuing with recipe. Cook and drain noodles as directed on package. Meanwhile, in large bowl, mix lettuce, cilantro, carrot and shrimp. Sprinkle water over 1 paper towel; place on cutting board. Fill a 10-inch pie plate with water. Place 1 rice paper wrapper in water 45 to 60 seconds or until pliable but not completely softened. Gently remove wrapper from water, shaking to drain excess water; place on damp paper towel. Starting close to 1 edge of wrapper, form a row of about 1/4 cup noodles. On noodles, arrange about 1/3 cup of the lettuce mixture. Starting with edge covered with fillings, roll up wrapper over fillings, stopping after first turn to tuck in sides. Continue to roll up, tucking in sides. Repeat with remaining wrappers. Place rolls, seam sides down and without touching, on platter. (If rolls touch, they will stick together.) Serve immediately with sauce, or cover with moist paper towels and refrigerate up to 2 hours. To serve, cut each roll in half diagonally. Rice paper (on left), an edible sheet, is made from a dough of rice flour, water and salt. It's great to have on hand for wrapping a variety of fillings. 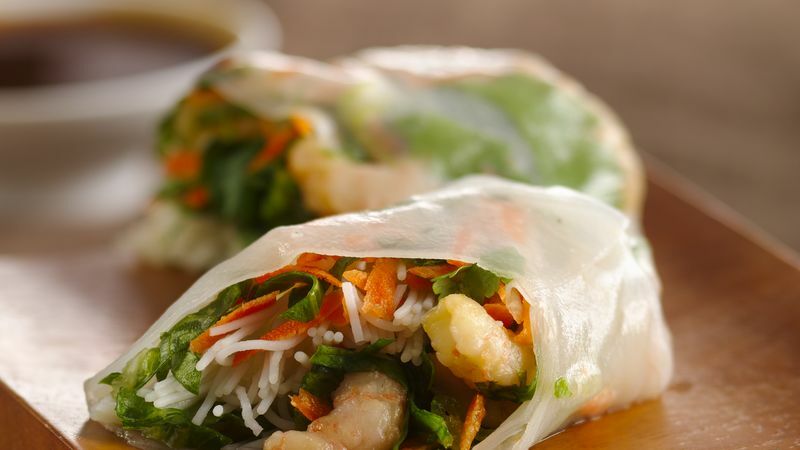 Look for rice paper in the Asian section of the supermarket or at Asian grocery stores. Chili paste is not the same thing as chili sauce. Chili paste, used in Asian cooking, is made of fermented fava beans, flour, red chiles and sometimes garlic. You can find it in the Asian-foods section of supermarkets.